4Videosoft TS Converter for Mac can convert your TS video or TS file to AVI, MP4, WMV, 3GP, 3GPP, MKV, FLV, SWF, VOB, DV, even HD videos, etc. And convert TS to MP3, WMA, OGG, MP2, AAC, M4A, WAV, AC3, etc. 4Videosoft TS Converter for Mac also accepts MTS, M2TS and all popular video or audio file as inputting file, as well as convert video to TS on Mac. 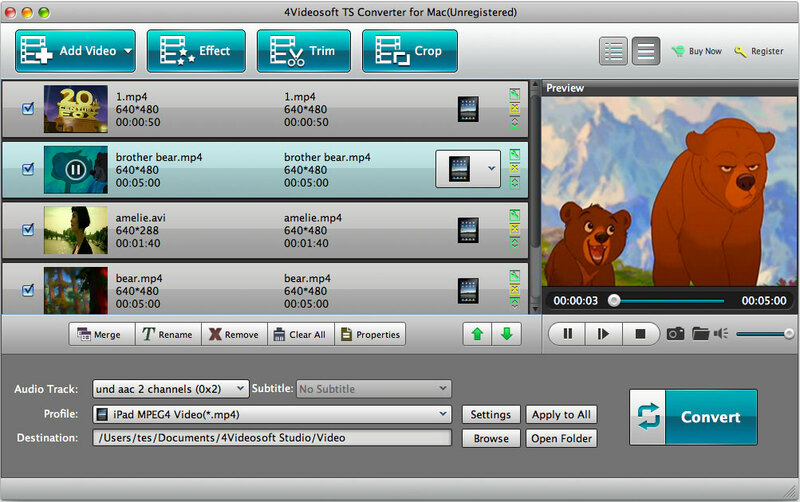 4Videosoft TS Converter for Mac can convert TS to video or audio on Mac OS. Convert TS video/file to AVI, MP4, WMV, 3GP, 3GPP, MKV, FLV, SWF, VOB, DV, etc. ...... brightness, deinterlacing, along with the Trim, Crop, merge your video, set video settings, and more. With 4Videosoft TS Converter for Mac, you can convert TS video to multi-formats, like AVI, MP4, WMV, 3GP, 3GPP, MKV, FLV, SWF, VOB, DV, even HD videos, etc. Also convert video to TS on Mac. You can get MP2, MP3, WMA, OGG, AAC, M4A, WAV, AC3 audio from TS and other videos, or audios for your music enjoyment with the assistance of 4Videosoft TS Converter for Mac. You can watch your TS file on your iPod, iPhone, PSP, PS3, Wii, Zune, Zune 2, Xbox, Xbox 360, Google Phone, Sony Walkman, Archos, Creative Zen, iRiver, BlackBerry, BlackBerry Storm, BlackBerry Bold, Palm Pre, Motorala, LG, Sony Ericsson, Mobile Phone, etc. Qweas is providing links to 4Videosoft TS Converter for Mac 3.2.12 as a courtesy, and makes no representations regarding 4Videosoft TS Converter for Mac or any other applications or any information related thereto. Any questions, complaints or claims regarding this application 4Videosoft TS Converter for Mac 3.2.12 must be directed to the appropriate software vendor. You may click the publisher link of 4Videosoft TS Converter for Mac on the top of this page to get more details about the vendor.